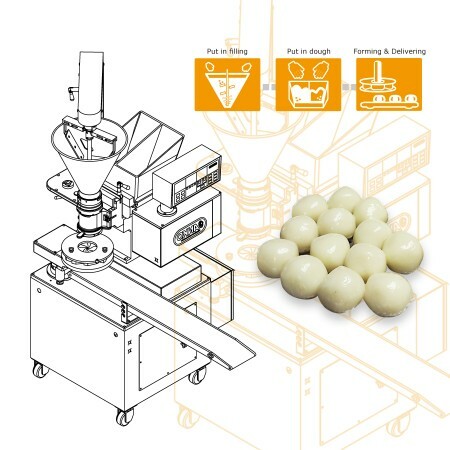 Filled Glutinous Rice Ball Machine and Equipment - ANKO High Efficiency Filled Glutinous Rice Ball Production Equipment Design | ANKO FOOD MACHINE CO., LTD.
ANKO's SD-97 Series of Automatic Encrusting and Forming Machines are recommended for producing filled glutinous rice balls. Not only it's easy to use, but it can also produce an array of stuffed dumplings and pastries, such as mochi, meat buns, filled cookies and pineapple cakes. And by adjusting the ingredients and recipes, the machine can be used to produce fish boilie and many ethnic delicacies. The machines are high in capacity and consistency, can efficiently save time and labor in the factories. For more detailed information about rice ball making machines, please refer to the following models on our website: SD-97W and SD-97SS, or please feel free to send us your product inquiry online, thank you. Filled Glutinous Rice Balls refer to a type of traditional Chinese dessert made with glutinous rice, and can be either made into small plain ones or larger sweet or savory kinds. It originated in China, and was consumed during "Yuanxiao" or also known as the First Full Moon Festival in the Sung Dynasty; however, during the Ming and Qing dynasty, people have started consuming glutinous rice balls on "Dongzhi", which is the Winter Solstice, as a way to worship their ancestors. Nowadays, it had become a traditional Chinese festive delicacy. The machines listed below are designed for making Filled Glutinous Rice Ball. Please feel free to contact us via the form below. We will happy to answer any questions you may have regarding our products, services, and turnkey projects. ANKO's Automatic Rounding Conveyor is suitable for all products that need to be rubbed into round and strip such as glutinous rice ball, sesame ball, rasgulla, gulab jamun, etc., The maximum capacity is 3,000-3,500 pieces with pleasing appearance like handmade. We assure you of the most efficient machines to maintain high quality and enhance capacity.